Vietnamese Politburo member and standing member of the Party Central Committee Secretariat Dinh The Huynh (L) shakes hands with Chinese President Xi Jinping in Beijing on October 20, 2016. Vietnam and China have promised to foster their relationship and strengthen the political trust between two nations, according to the Vietnam News Agency. Vietnamese Politburo member and standing member of the Party Central Committee Secretariat Dinh The Huynh joined talks with Party General Secretary and President of China Xi Jinping in Beijing on Thursday, as part of the former’s visit to China from October 19 to 20. 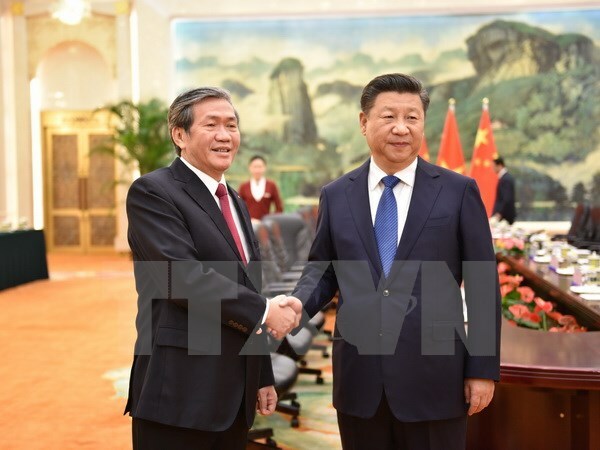 During the meeting, Huynh expressed his joy at the positive development in the Vietnam- China relationship, stating that the Vietnamese Party and state aim to respect their cooperation with their Chinese counterparts. The Vietnamese official requested that both nations seriously and effectively execute the common perceptions reached by their Party and State leaders that will help enhance political trust, improve the efficiency of multi-faceted ties, and encourage people-to-people exchange. Hanoi and Beijing should continue their efforts to preserve peace and stability in the East Vietnam Sea, and avoid all actions that intensify the current situation, according to Huynh. For the sake of each other’s interests, the two sides should seek out temporary and long-term solutions to their disputes in accordance with international law, namely the Declaration on the Conduct of Parties in the East Vietnam Sea (DOC), and the expedited establishment of a Code of Conduct (COC) for the maritime area, he continued. President Xi praised the visit of the Vietnamese high-ranking official, highlighting the recent common perceptions agreed by the two nations’ leaders, which were significant in the development of a healthy and stable Vietnam- China relationship. The Chinese head of state expressed his hope that two countries will carry out more exchanges of delegations, share their experience in Party building and national leadership, and continue push forwards the relations between the two Parties and States.